Do you need a server with essential features for your IT environment, which is constrained by budget, space or IT resources? 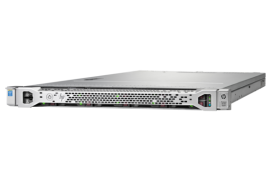 The HPE ProLiant DL160 Gen9 Server delivers the right balance of performance, storage, reliability, manageability and efficiency in a dense and compact chassis, to meet the needs of a diverse set of customers - from SMBs to service providers with a wide range of deployments - from general purpose IT infrastructure to the emerging "New Style of IT" deployments like cloud and big data in distributed computing environments. The HPE ProLiant DL160 Gen9 Server offers (16) DIMM slots of HPE DDR4 SmartMemory, with built-in intelligence to reduce downtime and up to 14%  better throughput performance. Embedded management to deploy, monitor and support your server remotely, out of band with HPE iLO makes it easier to manage complex IT environments thereby minimizing the IT resource requirements. Supports up to (2) Intel® Xeon® E5-2600 v3/v4 processors offering improved performance and efficiency. HPE SmartDrives continue to deliver optimal performance, capacity, and reliability to meet various customer segments and workload requirements at the right economics. Supports up to (4) LFF and (8) SFF 12 Gb/s with flexibility of (4) LFF NHPE option. The HPE ProLiant DL160 Gen9 Server offers dense and efficient design at a price point that provides agile horizontal expansion capability for distributed computing environments like Hadoop, NoSQL to cope-up with fast growing business needs. 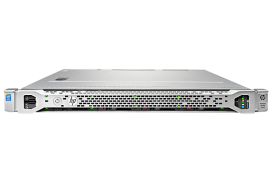 Standard with 2x1GbE, up to (3) PCIe slots and choice of HPE FlexibleLOM provide you flexibility of networking bandwidth and fabric so you can adapt and grow to changing business needs. Up to 92% efficient 80 PLUS certified entry-level HPE Power Supplies and ENERGY STAR® qualified server configurations illustrate a continued commitment to helping customers conserve energy and save money. With HPE ProLiant DL160 Gen9 Server, HPE OneView provides infrastructure management for automation simplicity across servers, storage and networking. Embedded management to deploy, monitor and support your server remotely, out of band with HPE iLO and optimize firmware and driver updates and reduce downtime with Smart Update, consisting of SUM (Smart Update Manager) and SPP (Service Pack for ProLiant).